You are here:HomeBlog[FAR Yerevan]: FAR Expands its Support to the Remote Border Region of Shamshadin. [FAR Yerevan]: FAR Expands its Support to the Remote Border Region of Shamshadin. In order to expand the coverage of its activities to the places most in need in Armenia, FAR has decided to stretch its helping hand toward one of the most remote and vulnerable regions of Armenia – the Shamshadin region of Tavush marz. Situated in the northeastern part of Armenia, Tavush marz includes Ijevan, Tavush, Noyemberyan and Shamshadin. The region borders Gegharkunik and Kotayk marzes to the south; Lori marz and Georgia to the north; and Azerbaijan to the east. Berd, its major town, is located about 200 kilometers from Yerevan, and has a population of roughly 9,000 people. The town used to be a center for diamond cutting, woodworking and food production industries. Today, sadly, almost no industry exists there. The same beneficiary group periodically receives supplies like school stationery, clothing, footwear and hygiene packages from FAR. The suppliers of humanitarian aid are organizations like the United Armenian Fund, UMCOR, etc. 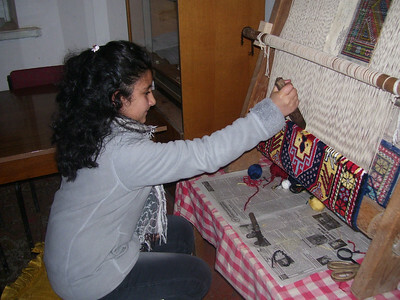 Thanks to Megerian Carpets, in 2011 the only art and music school in Berd received a bulk of carpet weaving yarn. UMCOR also donated some stationary to the school. Support to Aigepar Kindergarten includes three nutritious and balanced meals for 20 kindergarten children, thanks to CASP and the Women’s Guild Central Council of the Diocese of the Armenian Church of America (Eastern). Two students from Berd pursue higher education at the State University of Economics. FAR’s Mathevosian Scholarship Program pay their tuition fees. One student of the Yerevan State Teachers’ Training University has just received the Daughter of Vartan – Anahid Chapter Scholarship, which will enable her to obtain a bachelor’s degree and return to Berd to teach at a high school. 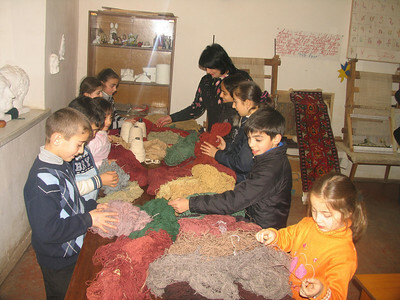 Children learn weaving at an art school in Berd. Children in the Tavush region received weaving materials as a gift. A gift for a child in Tavush.